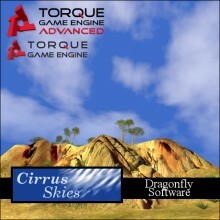 Dragonfly Software is proud to announce the immediate release of: Cirrus Skies for TGEA. Truth be told we quietly launched it some time back to see how things went. No major issues have been reported, and now the news is official! Cirrus Skies is a new ‘Cloud Management System’ for the Torque Game Engine. It adds new functionality and flexibility, allowing game developers to quickly create beautiful, lifelike and dynamic skies for their games. Cirrus Skies is available for purchase in the Garage Games: Developer Store. For more information please visit the Cirrus Skies Product Profile on the Dragonfly Software Website. Dragonfly Software is developing dynamic weather-effects for the Torque Game Engine. Our middleware add-ons produce a more immersive and life-like gaming experience. Our code is designed to be modular, flexible, clearly written and well documented to save end-developers time, money and aggravation. Dragonfly Software is a 2008 software-startup based in the Lowcountry region of SC, USA. as well as receive other updates! Copyright © 2008 · Dragonfly Software · All rights reserved.